The High Performance Computing (HPC) area has evolved significantly in the last years. Nowadays there is a wide range of systems that provide significant computing, storage and communication capabilities. There are parallel computers with very fast interconnection networks that can concentrate thousands of processors in a single machine. It is also possible to interconnect multiple clusters using the internet to aggregate the computing capabilities and to reach higher computing expectations. More recently a significant effort has been devoted to integrate multicore processors into these systems. Therefore, HPC is the use of parallel processing for the efficient, reliable and quick execution of advanced applications. The need of computing resources is a fundamental requirement in several science and engineering domains. HPC platforms have brought an unprecedented computational power to a wide range of the scientists. HPC is critical for research in several areas such as sciences and industrial sectors now relying on simulation for technical decision support. With its capacity to simulate and optimize the most complex phenomena, it will accelerate research, development and time-to-market for new products and services, and ideally will contribute to improve the environmental conditions. HPC platforms are cluster-based computing systems consisting of loosely coupled computers connected through fast networks for an efficient, reliable and quick execution of advanced applications. The term “supercomputer” is used to refer to a more powerful subset of HPC platforms, systems that perform at or near the currently highest operational rate for computers. While there are few supercomputing centres, HPC platforms can be found in any research and academic institution, and in many companies in a wide number of industrial areas. At this moment, our main investigation objectives will address the research and technology challenges of meeting the requirements of next generation Cloud Computing architectures for the efficient execution of compute and data-intensive High Performance Computing services. 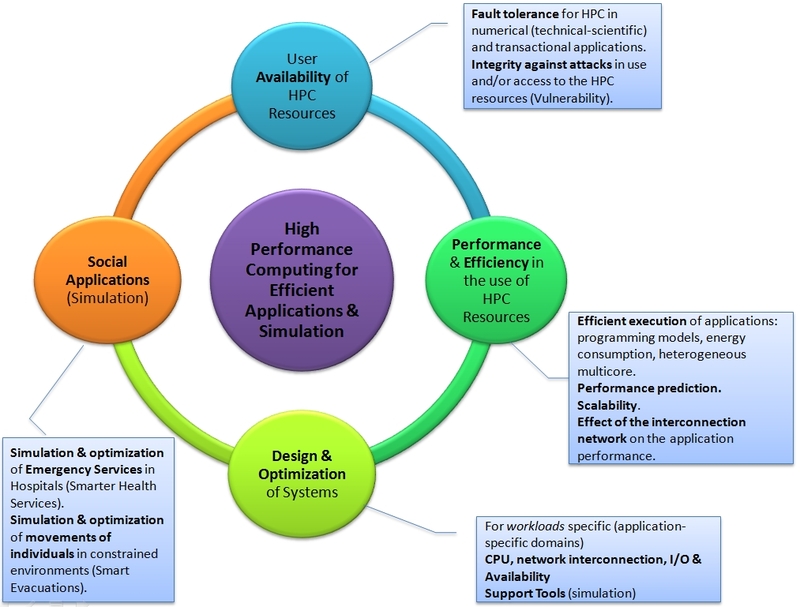 We have defined four strategic research objectives that correspond with the four architectural layers of HPC for Efficient Applications & Simulation (hpc4eas): Performance and Efficiency in the use of HPC resources, User Availability of HPC Resources, Design and Optimization of HPC Systems for Specific "Workloads" (application-specific domains) and Social Projection Applications. The results of the these research lines will offer a considerable improvement in resource utilization, energy efficiency and cost of current scientific and business infrastructures; will support new provisioning models for computing centres to offer on-demand capacity in order to scale user’s environment and accommodate ongoing growth, and will establish the principals of porting HPC applications to clusters and Clouds.